Ghost: The Musical is one of those touring Broadway shows that I would normally skip, not being a fan of the disturbing trend to turn movies into musicals rather than take the risk on a new original piece of musical theater. But there is one reason that I wanted to see it. Local actor Steven Grant Douglas, who impressed in several shows with Theater Latte Da* last year, is playing the lead role of Sam (i.e., the Patrick Swayze role). Steven is super talented and has a gorgeous voice, and very deserving of this opportunity, and I'm all about supporting our local actors (even when they leave us for bigger stages!). I knew that he would be great, and suspected that the musical would ho-hum, and I was right on both counts. When the thing people talk about after seeing a show is the illusion of someone walking through a door (or a falling chandelier), that doesn't point to a great piece of music-theater in my book. I'm reminded of something my favorite musical theater director Peter Rothstein says about musicals - content dictates form. That is not the case with this piece, which is perhaps its biggest flaw. At its core, Ghost is a small intimate love story, but Ghost: The Musical is a big splashy techno-heavy "show," in which the beauty of that story gets lost. The story would be better served with less tricks, a smaller cast, fewer showy songs, and a greater focus on what we really care about - the relationship between Molly and Sam. Here's the story in a nutshell: artist Molly and banker Sam are blissfully in love, until one night they're mugged and Sam is killed. He becomes a ghost that for some reason cannot pass on. He soon discovers that there's more to his murder than a random robbery. The man who killed him is after something, and Molly is in danger. Sam finally finds someone who can hear him, the psychic Oda Mae, who reluctantly agrees to help Sam save Molly and bring his killer to justice. The supernatural aspects of this story are brought to life on stage through illusions (credited to Paul Kieve - is there another musical with an Illusionist credit?) that show people and objects flying through the air, and yes, Sam walking through a door. The movie-ness of Ghost is replicated by a liberal use of the scrim and video projections. 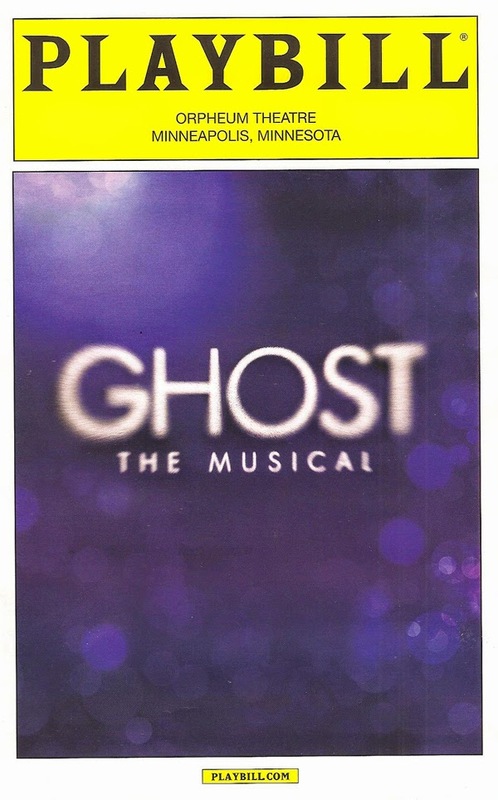 Ghost: The Musical is most successful when it focuses on the relationships, rather than the big dance numbers that, while entertaining with the rhythmic, robotic choreography by Ashley Wallen, well executed by the large ensemble, don't seem to fit and took me out of the story. Steven as Sam and Katie Postotnik as Molly have great chemistry and they both have gorgeous voices, especially when singing together. Also fun is the relationship between Sam and Oda Mae, played with delicious energy and verve by Carla R. Stewart. The scene in which the subway ghost teaches Sam how to "Focus" is a highlight, with Brandon Curry rapping and leaping around the stage in a way that you can't tell how much is illusion and how much is his great physicality. Two things that fans of the movie will insist on are both included in the musical - the song "Unchained Melody" and the pottery scene, although the latter plays out differently than it does in the movie. "Unchained Melody" is used in a clever way, with Sam jokingly singing it to Molly early in the show, and the reappearance of several phrases woven into the score later in the show. The original songs in the score range from lovely ("With You," Molly's song about grief and loss), to powerful (Sam's desperate cry "I Had A Life"), to gratuitous ("I'm Outa Here," a fun Oda Mae song that has no place in this show). Ghost: The Musical continues at the Orpheum Theatre in Minneapolis through the weekend. It's pretty much what you think it is, with some nice moments and great performances wrapped up in a techno-heavy show that fails to impress, as hard as it tries. *Theater Latte Da's Peter Rothstein cast Steven in three shows last year, and now he's playing the lead in a national Broadway tour, proving once again that Peter has a great eye for talent.